Harry Whiteman after winning a gold medal at the English National Championships. Harry Whiteman yesterday (August 3) added to City of Peterborough Swimming Club’s (COPs) national medal bonanza. Whiteman (17) won gold in the 1500m at English National Championships in Sheffield thanks to a time of 16 minutes 31 seconds. The scoreboard confirming Harry Whiteman's gold medal. He led from the start and his split stayed consistent at 1:06 per 100m. 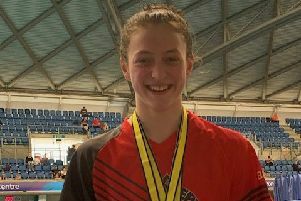 Whiteman, who has competed at British Championships and National Open Water champs over the past 10 days, said: “‘This was the medal I wanted more than any other. I enjoy distance races, I like the strategic input and playing mind games with my competitors. “(Coach) Ben Negus and I had a plan and the time achieved was bang on the plan. Ben was great poolside. It’s a real endurance over 30 lengths and seeing him gesture and move his arms to keep me on track really motivated me and kept me focused. COPs won eight medals, including two golds, at the British Championships which finished in Sheffield this week.